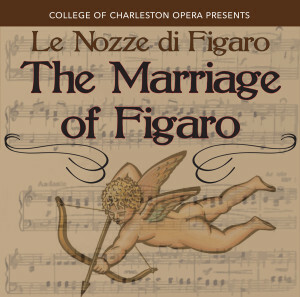 The College of Charleston Opera program in the College’s School of the Arts will present the sublime masterpiece “Le Nozze di Figaro” (“The Marriage of Figaro”). This comic opera by W.A. Mozart, will take audiences on a laugh-out-loud ride filled with schemes, masquerades and mistaken identities. The infamous Figaro, his bride-to-be Susanna, and the Countess conspire to expose and embarrass the cunning, skirt-chasing Count. Jordan Boyd stars as the subversive Figaro, and Ashley Fabian (Saturday) and Courtney Richmond (Monday) play his clever bride, Susanna. Abbie Geddings portrays the randy pageboy, Cherubino. Kori Miller (Saturday) and Cherise Sickles (Monday) play the longsuffering Countess, and Nathan Matticks plays her husband, the Count, who must be taught a lesson. Performances will take place on Saturday, Jan. 26 and Monday, Jan. 28 at 8 p.m. in the Recital Hall of the Simons Center for the Arts, 54 Saint Philip St. Tickets may be purchased online or at the door. $20 for adults, $10 for College of Charleston students with a valid ID.